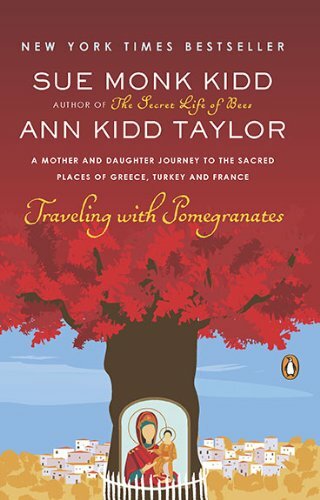 A wise and involving book about feminine thresholds, spiritual growth, and renewal, "Traveling with Pomegranates" is a revealing self-portrait by the beloved author of "The Secret Life of Bees" and her daughter, a writer in the making. professional member of the British Computer Society, a Chartered Software Engineer and holds degrees from Manchester and London Universities.Sue Monk Kidd was born in Sylvester, Georgia on August 12, 1948. She received a B.S. in nursing from Texas Christian University in 1970 and worked throughout her twenties as a registered nurse and college nursing instructor. She got her start in writing at the age of 30 when a personal essay she wrote for a writing class was published in Guideposts and reprinted in Reader's Digest. She went on to become a contributing editor at Guideposts and a freelancer. She primarily writes non-fiction, but is best known for her novel, The Secret Life of Bees, which won the 2004 Book Sense Paperback book of the Year. The book was made into a movie in 2008. Her other works include God's Joyful Surprise, When the Heart Waits, The Dance of the Dissident Daughter, Firstlight, and Traveling with Pomegranates: A Mother-Daughter Story. The Mermaid Chair won the 2005 Quill Award for General Fiction and was adapted into a television movie by Lifetime. Sue's title, The Invention of Wings, was selected as the Oprah Book Club 2.0 read in January, 2014. This title also made The New York Times Best Seller List. Ann Kidd Taylor, daughter of the acclaimed author Sue Monk Kidd, graduated from Columbia College in South Carolina. She worked as an editorial assistant for Skirt! Magazine for two years and co-authored the memoir Traveling with Pomegranates with her mother.